I love that Peter was never afraid to ask questions. 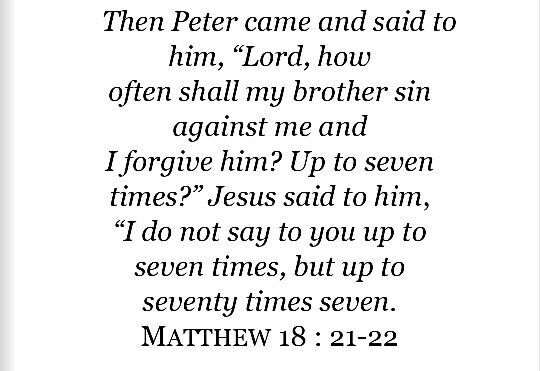 I also find it interesting that Peter probably thought he was being generous by asking Jesus if should forgive his brother seven times. Jesus then tells him as we forgive others we need to remember how much God has already forgiven us, and forgive others based on God’s great love and forgiveness of us. Forgiveness is not an easy topic. I have a bad habit of internalizing the negative things that people have said about me. The pain that I have experienced does not need to become the means by which I define myself. I can chose the path of forgiveness without justifying the actions of the person that wronged me, or believing the lies that the person’s words or actions spoke about me. 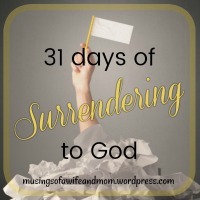 I can live a life with my arms wide open to God’s grace and forgiveness and show that forgiveness to others remembering the truth of Romans 8:1 There is therefore now no condemnation to those who are in Christ Jesus,[a] who do not walk according to the flesh, but according to the Spirit. I am reminded of these lyrics from a song by Tenth Avenue North. May I walk in the light of God’s forgiveness today, remembering the depth of God’s grace and forgiveness for me and sharing that forgiveness with others. Thank you Denise! I loved your Tuesday at 10 post this week too.